A horse needs three things to be a healthy horse. That is, first, friends; second, movement; and third, continuous munching on celluloses (fibers). If one of these conditions is missing, then a horse can not be a sound horse. Our horses are free to roam and socialize on 13000 m2 of pasture and paddocks, provided with spacious shelters. This has a proven positive influence on the physical as well as mental well-being of horses. Our pasture grounds do not look like the immaculately groomed fields with good fences, green grass and no weeds in sight as is usual in traditional horse keeping. Instead, our pasture & paddocks are stony and uneven, with a wide variety of plants, trees, grasses and weeds. We believe that imitating Nature is the key to success in a horse's diet. Horses must eat from a wide variety of cellulose (fiber) sources to maintain a balanced diet. This is why in the wild they move more than 20 kilometers a day to find it. The exercise gained in searching for the food and the eating at varying times during the day make for optimal digestion and nutrient dispersion within the body. Horses have the unusual ability to know what their body needs in terms of specific herbs or nutrients long before it becomes a problem. A horses stomach is considerably small compared to the size of its body, which means it spends some 18 hours a day grazing in order to keep filling it up. A horse will eat much more than just grass and hay. It will eat bits of bark, flowers, leaves, herbs and weeds, and also plants with thorns. Besides, horses will lick certain surfaces, like soil and iron, to gain minerals. Horses with free access to a variety of food will not eat poisonous plants unnecessarily. Next to the freedom to graze on a wide variety of plants and grasses 24/7, our horses get extra feeds of high quality grasses selected from different soils at least three times a day, so that they can keep continuously munching. Every day the horses' droppings are removed from the land. In this manner contamination of worms is minimalized. Our horses have free access to clean water and free-choice minerals and salts which they can consume according to their needs. 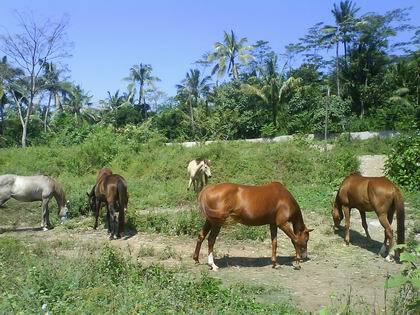 Local horses - as there are our Sandelwood and Sumba horses - can live perfectly on grasses and hay only. Bigger sized horses usually need some extra food for high performance. For our mix of wheat bran, rice bran and corn we use organic fresh ingredients. The choice of naturally available minerals we add is based on extensive research, adapted to the PH-value of the soil our horses live on (see Library: Pat Coleby). We feed no artificial ingredients and no molasses or sugars whatsoever. The shiny coat, strong hoofs and general well-being of our horses prove that this is the key to a healthy horse. 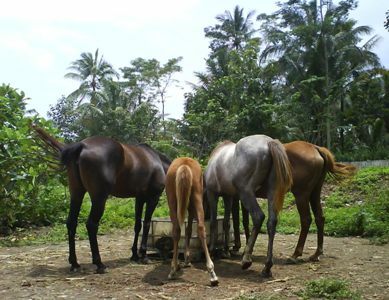 We have had the immense pleasure of having some foals born at our premises, among others Fitri, Prima, Yente, April, and Foxy, as we gave their dam and sire the opportunity to breed in freedom. When there are no complications, a healthy horse is perfectly capable of delivering without help from human beings and usually will give birth between 2 and 4 a.m. - because around that time there are no predators around. We let nature take its place and enjoy the surprise in the early morning when the foal is already standing wobbly on its feet and is drinking its essential first milk. The separating, or weaning, of the foal from its mother will take place when the foal has reached the age of eight months or more. The foal will tell us when it is ready, and will suffer no trauma when we place it in another group of horses, still being able to see its mother. In this manner, weaning is casual and without drama. 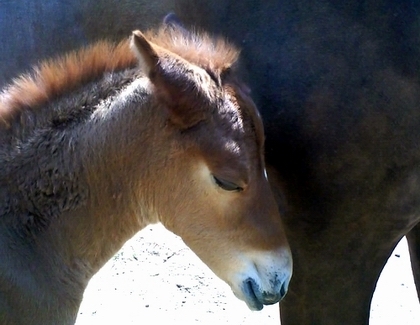 The foal will be raised by its mother as well as the other horses in the herd, and will grow into a social and mentally well-balanced horse.